In this moving and powerful book, she shares inspiring quotes, prayers, and reflections designed to get readers thinking, get them feeling, get them laughing, and help them in their journey to what she calls The Open Field–a place of acceptance, purpose, and passion–a place of joy. I'm sure I'm not always easy to live with. In fact, I've been told so much by my husband and kids. I'm grumpy and depressed, and most importantly, I've been having a lot of self-doubt. I realize it's not a good thing for me or my family. And that's why this new little book by by Maria Shriver called I'VE BEEN THINKING... REFLECTIONS, PRAYERS, AND MEDITATIONS FOR A MEANINGFUL LIFE is so important to me. I'VE BEEN THINKING... is a wonderful inspirational book on how to lead a more meaningful life. I've always respected Ms. Shriver as a journalist, mom, and philanthropist; and I think she has a unique way of using her life experiences to help others. I first read I'VE BEEN THINKING... in one day when I was home all by myself for a weekend; and since then, I've referenced it when I need a little pick me up. 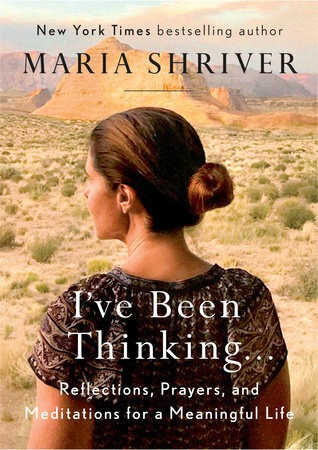 I'VE BEEN THINKING... is a collection of essays collected from Ms. Shriver's e-newsletter, The Sunday Project. (If you aren't already a subscriber, I highly recommend it. The email is a treat every Sunday morning for me and helps start the week of on the right track.) These essays have a variety of themes including family, motherhood, the power of women, gratitude, faith, forgiveness and more. Each essay is just a few pages long and includes a prayer at the end, so the book is perfect to use as a daily devotional of sorts. Since I'm coming clean in this review, I might as well tell you that I have a horrible time with keeping perspective. The little things in life drive me crazy, and I rarely look at the big picture and appreciate how very much I do have. I'VE BEEN THINKING... has helped me with that. Just hearing that someone like Ms. Shriver has similar feelings makes me realize that what I'm feeling is not uncommon, and her words of wisdom remind me to be grateful every day... and most importantly to not be so hard on myself. I will admit that it's not easy for me and I'm definitely a work-in-progress; however, I'VE BEEN THINKING... has helped me and will continue to help me. This book will sit on my nightstand for a very long time! I'VE BEEN THINKING... is one of those books that you want to share with every woman in your life. There is so much advice and wisdom (and even humor) between the pages of this small book, and you will want to reference it over and over again. Highly recommended and it's the perfect Mother's Day gift idea! It sounds like this was the perfect book for you at the perfect time. I'll have to check it out.